Poland, c.1830. Decorated with a lion, unicorn, a bird and houses. Engraved in hebrew “this is the cup of holy coins”. Often, when the rabbinical leader of a community (the rebbe) would have a favorite follower or student, he would give him some of his silver coins or eating utensils. The recipient would take these coins or utensils to a silversmith to make them into a cup or if he was given a significant gift, a menorah. More often than not, the coins were scarce so the cups made were small. 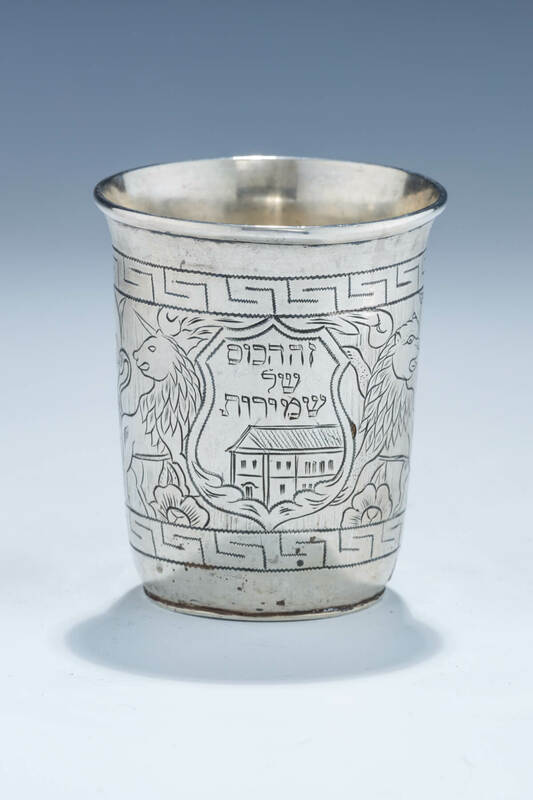 These “shmirah” cups were held in great esteem since their silver content had been previously owned by a tzaddik, a holy person. An added holiness would, therefore, be bestowed upon the user during the recitation of the kiddush on the sabbath. Marked 12. 2.9” tall.